Manic minstrels, The New Ropes will be calling in at the Seaton Delaval Arts Centre for an evening of hilarity and Python-esque absurdism spliced with beautiful acoustic music from various world traditions, in a precision-honed yet uproarious performance as part of their Farewell Tour. 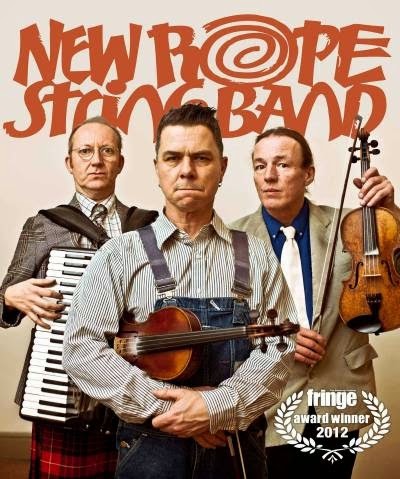 The New Rope String Band have come to the end of their tether. The sheer strain of spreading joy around the world for more than 25 years as Old and New Rope has proved too much. Audiences’ laughter muscles have been stretched and twanged and they, too, need a rest. But, before these ageing folk-cabaret artistes go their separate ways, heading for new and exciting theatrical and musical horizons, they have decided to do a farewell lap of honour, a celebratory extravaganza of their finest routines with some specially-created final flourishes. Expect fish tanks, boiled eggs, fiddles, banjos, cardboard guitars, theremins, explosions, interactive films, drainpipes, mermaids, pink y-fronts, thrills, spills, tears and hilarity. The New Rope String Band are: Pete Challoner, Tim Dalling and Jock Tyldesley. Once seen, never forgotten: combining superb musicianship with side-splitting comic genius. For diehard audiences it’s a chance to come along, laugh once more and say goodbye. For those who’ve never seen them, wake up, this is your last chance! Partnering with Highlights Touring Scheme, Seaton Delaval Arts Centre welcomes audiences to a night of top notch music and merry mayhem – and a final chance to enjoy these truly unique entertainers. The show takes place on Sunday 15th February at 7.00pm. Tickets are priced at £8.00 for full price and £7.00 for concessions and available from the Box Office on 0191 237 5460 or online at www.seatondelavalartscentre.com.